New York City, NY, US – July 21, 2011 – Cocoon Innovations, the award-winning creator of stylish bags and cases with purpose, is excited to announce the availability of the Central Park Professional Backpack. Made from tough ballistic nylon, the Central Park Pro features a stow-away water resistant hood for rainy days and the GRID-IT! Organization System -- a rubberized woven elastic object retention system perfect for organizing laptop accessories, iPod, iPhone, BlackBerry and other digital devices. Designed with the creative professional in mind, the sleek yet spacious Central Park Pro features a padded laptop compartment that will fit up to a 17" notebook or mobile workstation. A handy media pocket near the top of the bag keeps the user's smart phone or MP3 player safely stored away while listening to their favorite tunes. Both compartments are sealed with waterproof zippers, and the open, mesh side pocket is great for storing a water bottle. The Central Park's ergonomic shape, air mesh padded shoulder straps and back, as well as an adjustable sternum strap, ensure a comfortable, cool fit. The smartly designed bag evenly distributes the weight of larger screen notebooks to avoid putting added stress on the user's shoulders or back. The top handle and bottom strap make lifting the bag in an out of an overhead compartment a snap. 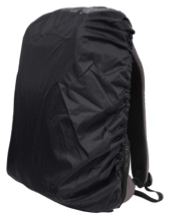 The Cocoon Central Park Professional Backpack is available now in Black, Brown, Gray and Red on www.cocoonbags.com for $79.99. Follow Cocoon on Twitter @cocoonbags or on Facebook for the latest news on the company's complete line of award-winning bags and cases.